On March 8th I presented two workshops at the annual conference of Massachusetts Agriculture in the Classroom. You can check out their website here. 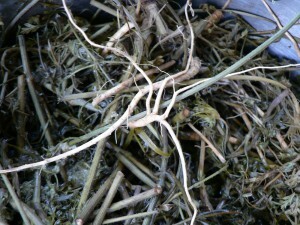 One workshop was on growing and processing flax, and on ways to incorporate flax into the school curriculum. The other was on growing a dye plant garden at school and using dye plants with kids. 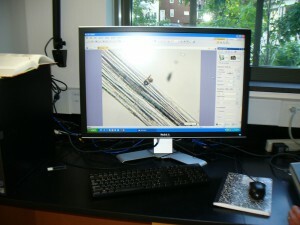 On Thursday, May 17th, our flax and linen study group met at the lab of one of our members to look at flax fibers under a microscope (and cotton and wool, for comparison). It was so incredibly fun! 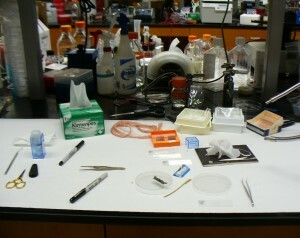 Here are the tools and equipment we used to make slides. We used tweezers to position our samples and to pull them apart a little to separate the fibers so the light could pass through. We put our samples on a slide (in the square boxes on the right), and added a drop of the mounting adhesive on top (from the little bottle in the blue box). Then we dropped on a small glass cover and used tweezers to press out the air bubbles and get the adhesive to spread evenly between the slide and the cover (small glass covers are in the orange box). Sharpies are for labeling slides. The pink yarn in back is madder-dyed 40/2 linen. Scissors and razor blades are for cutting. 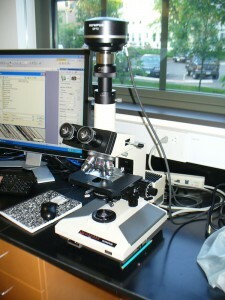 Because the samples were dry, we could make permanent mounts. Folks brought in a range of flax in various stages of processing: dried but un-retted, retted but unbroken, and retted and broken but not scutched (or hetcheled), and fully processed strick, both old and recent. 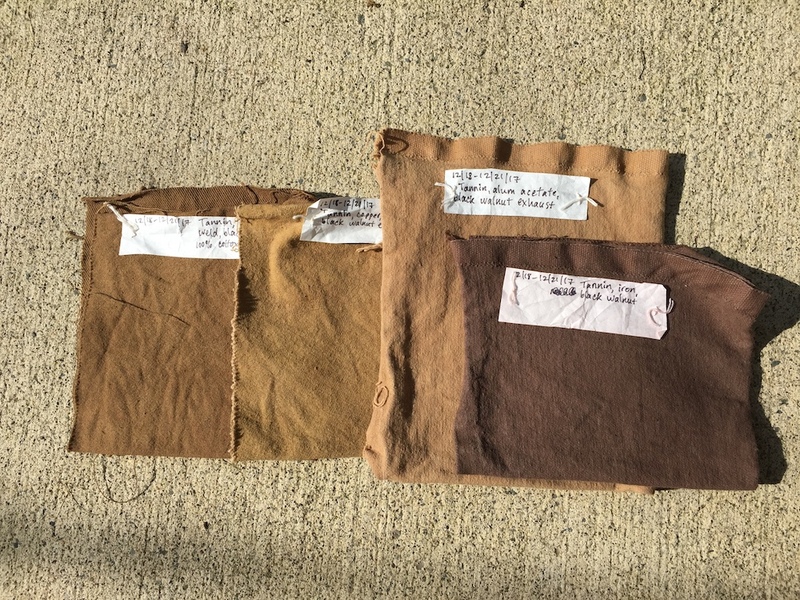 We looked at flax in several different stages including some of my naturally dyed yarn. Here’s the big monitor, which was awesome because we could all see the slides without having to take turns looking through the microscope. The program let us do things like adjust the color and take photographs. We took a lot of very beautiful photos. Here are a few highlights. 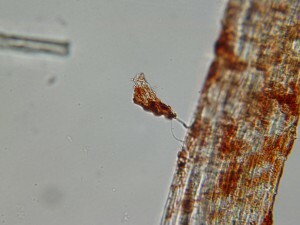 This image shows the tips of two flax cells overlapping. You can see it in the upper-most edge of the large central bundle, just to the right of the less-in-focus strand that’s crossing diagonally in the left hand corner. 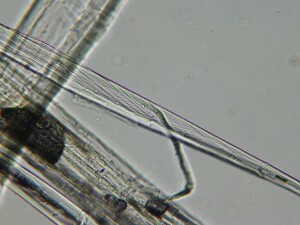 Those two greyish-colored pointy tips are the ends of two fiber cells. The granular purplish area just to the right of the overlapping cell ends shows that part of the structure of the fiber there is hollow. The black circles are air bubbles. Beautiful but irrelevant. 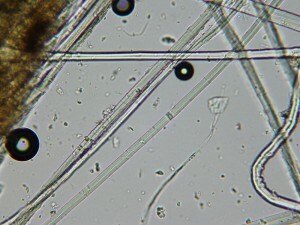 This image shows cotton fibers for comparison. 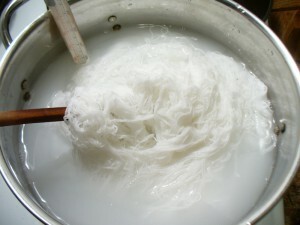 Cotton fibers are flat and ribbon-like in structure, and they twist, whereas flax fibers are rounded or tubular. 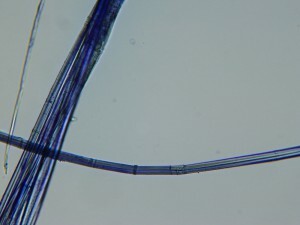 There is some twist in the structure of flax fibers, also. The image below shows this twisting (in a greenish color in the thin strand in the center). 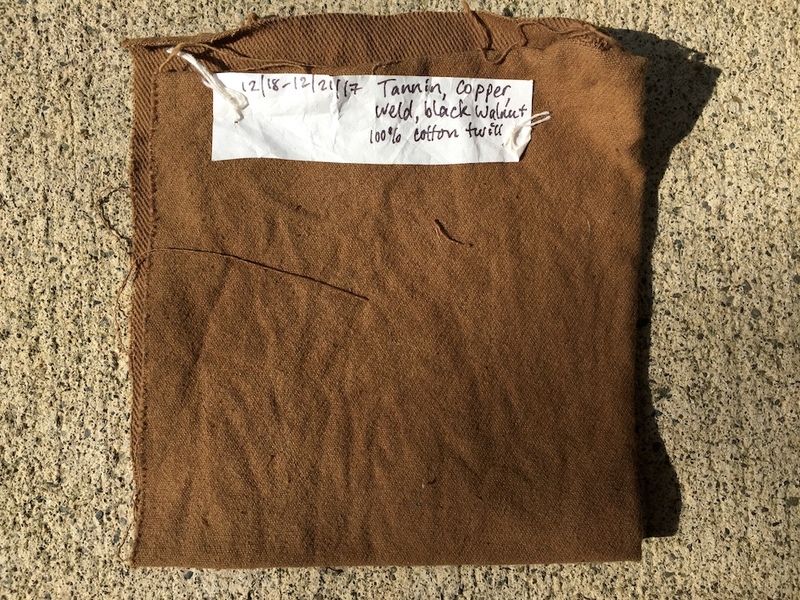 One important thing I learned on Thursday is that the flax fibers we use for spinning and weaving are not the fibers from the circulatory system of the plant (xylem and phloem), which I had previously believed. 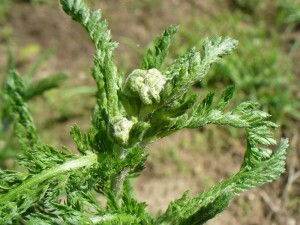 In fact, they are the structures that give the plant strength and rigidity. They are associated with the vascular cells but are different. 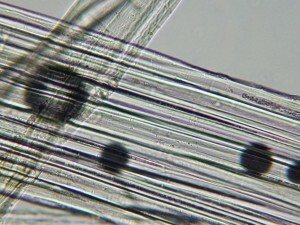 The two images below show strick fibers (fully processed and ready to spin) from the Zinzendorf brothers in Pennsylvania. 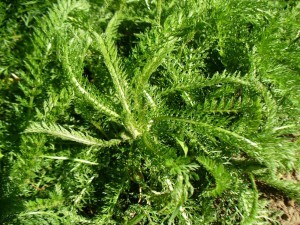 The flax was grown and processed on their farm. In the top photo, the center-most green, translucent strand shows the horizontal bars that are typical of flax fibers. In the upper left hand corner you can also see some brown decayed plant matter that is still sticking to the fibers. Click on the images to see a larger view. On slide below we used a stain that shows lignin (the woody material that makes the fibers strong and rigid) in blue and pectin (the starchy glue that holds cells together) in pink. This is a piece of water-retted flax fiber. 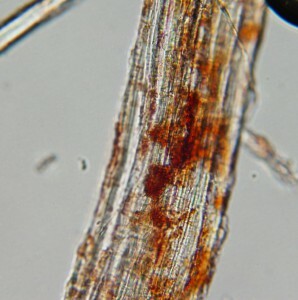 In the process of water retting, bacteria consume the pectins and allow the fibers inside the plant stalk to separate from the woody core and the outside “skin” of the stalk. 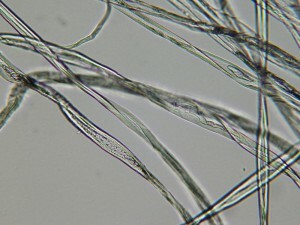 If you let the retting continue until all the pectins are eaten, then the individual cells separate also, and you don’t get long fibers to spin. You just get a hairy mess. 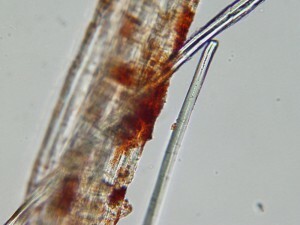 So, since these fibers are still holding together, there is still pectin present. We think the blue made the pink hard to see. You can see the tubular structure of the flax fibers and the horizontal bars very clearly. 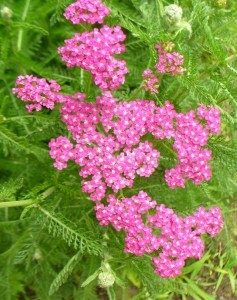 The photos below show pale pink madder-dyed 40/2 linen. 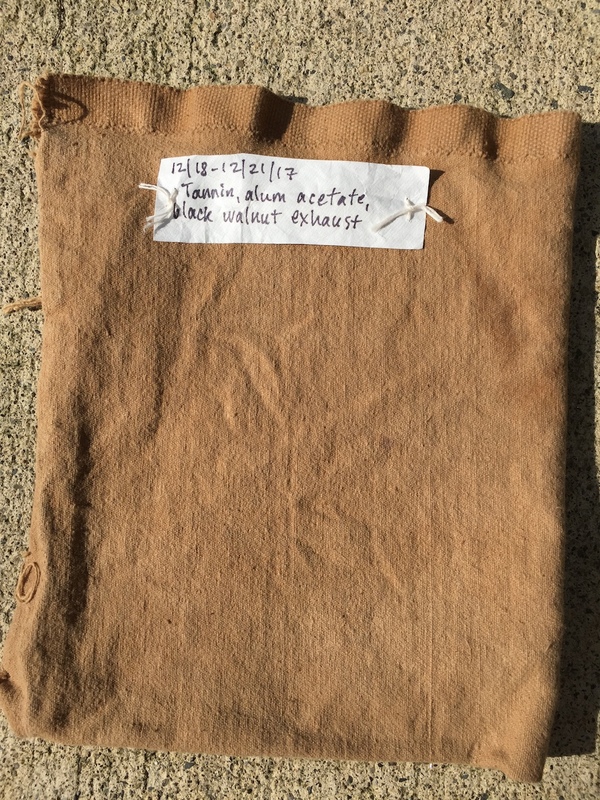 I used alum acetate for the mordant. I was amazed at how the color sticks to the fibers in clumps. I wonder if yarns with a darker color would show the color adhering more evenly. 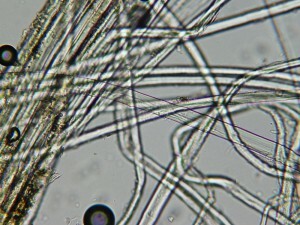 This photo shows some strands of undyed fiber next to the dyed fibers. I wonder if these were on the inside of the yarn and came free when I teased apart the snippet of yarn to put on the slide. Who knows what is going on here, but whatever it is, it doesn’t look good. That little nugget of color is about to get away. Hopefully we will have a chance in future to look at cross sections of the plant stalks at different points in their growth, to see how the fiber bundles develop. Science is fun! I decided to let the twice-mordanted bleached 10/2 cotton skeins air out until the vinegar smell was extremely faint, but not the full 4 to 7 days that Liles recommends. They dried from Thursday morning until Saturday morning, then I used a fixing solution. I used half an ounce of calcium carbonate, which suspends in the water more than dissolves, really. I didn’t use dung. I stirred it up with very hot water, added the dry skeins, put the pot on the stove, and heated up to about 150 degrees, stirring periodically, for 30 minutes. It almost looks like I’ve dyed the skeins white. After 30 minutes, I pulled out the skeins and rinsed them twice, then I had to go to work so I left them to soak in plain water. In the evening I rinsed them twice again. As it turned out, the fine, moldy-looking film which had been growing on the surface of the madder dyebath got displaced by increasingly large bubbles from fermentation (I assume–not sure about the microbiology here). The dyebath was a bit slimy but none the worse for wear, and it didn’t even smell too bad. I know I said that I wasn’t going to try anything new this time around except for the scouring and mordanting steps, but I did try two other things. Liles suggests soaking the goods in the dyebath for at least half an hour before applying any heat, and then heating for at least 2 hours. He writes that alizarin, the main red-producing dyestuff in madder roots, is not very soluble in cold water, and just a little more so in hot water. 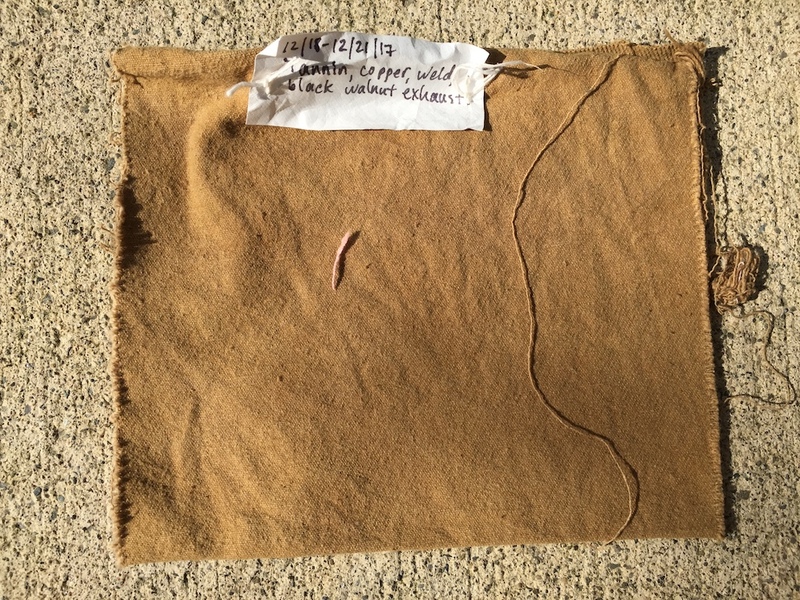 Starting out cold, raising the temperature slowly, and heating for a prolonged period of time (Liles recommends up to 3 hours for cotton) allows the fiber to take up the alizarin as it slowly dissolves. I did soak the bleached cotton skeins before heating. I soaked the first two for 30 minutes, and the third for about 6 hours. Each has soaked overnight in the dyebath before drying and then rinsing. I will post a photo when they are all done. 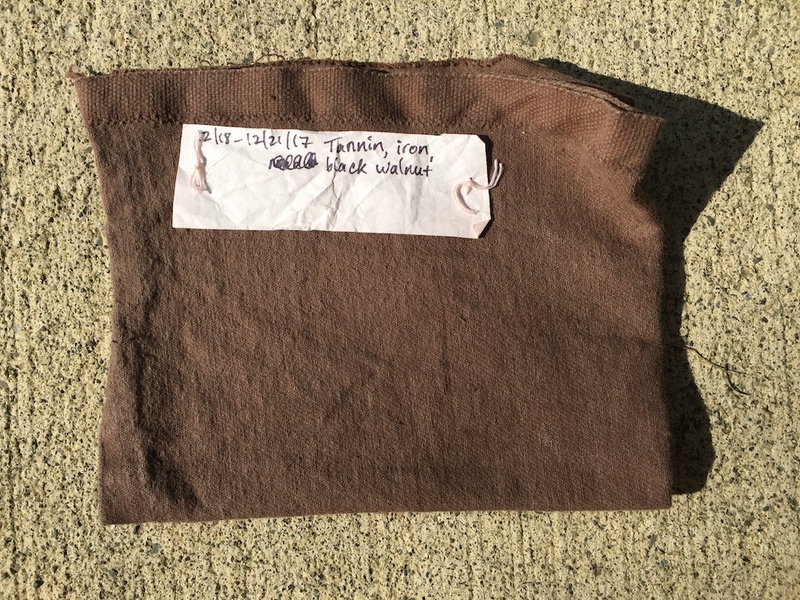 I have mordanted my bleached 10/2 cotton skeins a second time with aluminum acetate, which involved heating at 100 for an hour (it actually got up to 150 at one point, oops), cooling overnight in the mordant bath, and hanging outside to dry this morning. This afternoon they are not yet dry, but they do have a strong vinegar-like smell which I think must be the acetic acid Liles mentioned. So I gather I ought to wait until that smell dissipates, which could be several days, before I dye the yarn. Meanwhile, my madder bath is starting to get moldy. I have a pretty high tolerance for decomposition and stinky things, but in a few more days it will be yucky. What to do?